Eagle Cap Skip Club and Ferguson Ridge Ski Area are names you will hear year round when you spend time in Wallowa County. The people who started Fergi are the same people who continue to operate this sweet ski run, dedicating their heart and souls to it year round. Here’s a short history of one of our favorite mountains. The story begins around 1939 when a current location was established and a rope tow was installed. The site was locally known as Stanley Hill, but most would know it as the Buhler Ranch. The rope tow was powered by an old engine from a Model A Ford. In 1948 the tow line was moved to what is now known as Ski Run Road, about a mile as the crow flies. In 1950, the engine was replaced with a motor from a newer Plymouth, and the tow line was moved south to a better part of the ski mountain. It was this year when the local ski club was formed with several skiers who became the future drive and volunteer help behind the Ski Run. You can find a published Memoire at the Wallowa County Museum. The Ski Run area has had nice additions and upgrades over the years since. These improvements included a small warming hut, rope tow, ticket shack, cook shack and parking area. Families kept this little ski run operating and always were looking for ways to improve it, always watching the budget too. Many of these people to this day are active members, now known as Fergi. This was the early history of what would eventually become Ferguson Ski Ridge. I remember many weekends skiing Fergi and climbing the hill on the ole rope tow. We would go thru several pairs of gloves over the season because the friction of holding moving rope ripped the palms of the gloves apart. The rope would run over metal wheels about waist high. You had to let go right before the metal spoke apparatus and using your momentum grab just past the spoke and continue on up the hill until the next spot. The tricky parts came when the rope would go closer to the ground and you would have to lean down, or pull the rope up. Not an easy job when you are all but 10 years old! There are many articles that talk of night skiing, but I never personally took part in it. Rumor has it that kerosene lanterns were hung from the trees to ski by, or the headlights of cars as you got closer to the bottom. Soon a generator was brought to provide electric power to the ski tow, but I can’t imagine it let off enough light to really see where you were going as you whisked down the slopes. Eventually, talk of moving to a T-Bar tow system would come up during the membership meetings and discussions about where to move the ski run began to emerge. With the location gaining popularity, so did the dissention among the neighbors who were being crowded out of their parking spots and losing the peaceful nature of living up in the trees. Discussion was had on moving the Ski Run to Salt Creek Summit or a placed called Ferguson Ridge located about a 15 minute drive from Joseph, Oregon. Salt Creek Summit while having a better snowfall, was quickly ruled out when having to partner with the Forest Service meant a lot of red tape, and doing things “their way”. This tight knit group of “starting from scratch and making it a great place” didn’t really want to be told how to do things the “Forest Service way”, so Ferguson Ridge quickly became the favored spot. Ferguson Ridge was owned by Boise Cascade. Boise Cascade at the time was open to the idea of leasing the land to the ski hill organizers, but eventually the company cooled on that idea. So a new plan was hatched. Timber land that was owned by another group of people was soon traded for the Boise Cascade land, and Ferguson Ski Ridge began to take shape in 1983. Many hours of volunteer work started up again with designing the ski hill and facilities and clearing brush. John Deere equipment was brought in, manual labor was in full force and eventually the little Ferguson Ski Ridge started to show what it was going to offer to its skiers. The trade for all of this manual labor came in the form of a free day of skiing to the volunteer worker bees. In 1983, the Ski Run started to be moved over to Ferguson Ridge by moving the shacks and the rope tow to its new location. Many families and people helped. The slopes were always covered with people hand piling slash piles and burning piles. If you haven’t been involved in an organization like this, you wouldn’t understand the motivation and driving forces behind it. Consider that you have younger single people helping who are skiers, working right along side single people who don’t ski, and everyone is so excited to for the worthy cause. Business owners and locals donated cash, machinery and additional labor. People from within Wallowa County here in NE Oregon, and people coming in from out of the county all came together to help. This story doesn’t do justice to the families, individuals, and businesses that really took to the job at hand in making Ferguson Ski Ridge reach its full potential. People appreciated what “could be” and even if their feet would never hit a ski in the winter, saw the potential for what it could do for the entire community. The opening season for Fergi was the winter of 1983. It was a great winter, and Fergi saw many people upon its slopes. This was also when a Ski Patrol was deemed necessary and again was staffed by volunteers. To read accounts of what people did to get this little ski run in operating is amazing and comical all rolled up into one. One account talks about a pulley system that was manufactured out of melted beer cans that operated a remote speed control. Another account talks of a beer can being strapped to the first T Bar assembly and run the whole loop to make sure that all was safe and it would travel back. The dedication to what seemed impossible to many was often the driving force behind getting this up and running. The accounts of hours being donated, businesses donating their services, individuals donating what they could to construct what needed constructed peppers many of the stories I read while researching for this little ditty on Fergi. Nowadays, Fergi is packed most weekends. A lift ticket is still under $20, and you can sit back and enjoy the kids and adults alike skiing down the slopes. If you sit at the lodge long enough, you can hear the stories start to flow about the “old timers” that put this impossible plan into action. As a long time resident of this beautiful area, I am so very grateful for them seeing the impossible and making it possible! 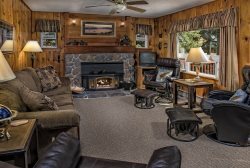 After a day of skiing on Fergi or enjoying a nice summer swim on Wallowa Lake, you’ll appreciate staying in of the vacation cabins or homes at Wallowa Lake Vacation Rentals, a family owned business for 25 years located at the base of the Wallowa Tram. Be sure to phone our office and let us help you and your family have the best vacation ever in beautiful Wallowa County.